Some way of shaping; in particular the potter's wheel. White ware "pottery" thus is not really pottery, even so it is usually called that, and those amazing "ceramic bottles" of the Moche culture in South America aren't pottery proper either since, while made from clay and fired, they were not made on a wheel. This gives an easy distinction: If it is not pottery proper, let's call it ceramics. Doing justice to the history and technology of pottery would mean to write another hyperscript like this one. I'm not going to do that. I will only give a few essentials, hoping that nobody will note that I don't' know a thing about pottery myself. Pottery is about pots made by potters. Pots - hollow objects able to contain some liquid - are extremely useful if not absolutely necessary to any life-style that can be described as remotely human. Try to make or drink beer without a "pot" and you get the point. However, you do not need a potter and pottery proper to make a pot. You can do that simply by hollowing out a stone, letting some quicklime solidify, or by using "bio-pots", e.g. gourds (hollowed out and dried pumpkins). There are many other ways. If you only want to contain liquid, you might use a leather bag, the good old goatskin for wine, for example. Before I now get carried off, let's just look quickly a the ingredients given above. Clay is a general term for all kinds of minerals that can absorb water and become pasty in the process. They have in common that the mineral particles are rather small (below about 2 µm), consist of some kinds of silicates or aluminates or mixtures, and - maybe most important- resulted from the weathering of rocks, in particular hard granite, a complex mixture of feldspar, mica and quartz. Granite, as we know, is rather durable but given a million years or so and some carbonic acid (H2CO3, simply carbonated water), it will erode into Kaolin or Kaolinite, the particular good "clay" used for making "China", i.e. porcelain. Feldspars are kinds of silicates or aluminates, crystals composed of, for example, KAlSi3O8, NaAlSi3O8, or CaAl2Si2O8. This might look like very special stuff from advanced chemistry but these kinds of rocks actually make up 60% of the earth's crust! Look around yourself somewhere out in nature and chances are that you see feldspar. Mica is something horribly complex but nevertheless just a "layered" silicate, and quartz is just the pure unadulterated silica, SiO2. When all that stuff falls apart, Kaolinite or Al2O3·2SiO2·2H2O results. This and whatever else will be clay some day is washed downstream and ends up as deposits on the bottom of lakes where we will find it after the lakes have dried up. Pure mica, basalt, and God knows what else may also produce some kind of clay when it decays. Between nanometer thin platelets of silicates, aluminates, God knows what else, is room for varying amounts of "dirty" water. Incorporation of water leads to swelling and pasty consistency; driving out the water produces a solid. What clays really look like is not so easy to see. If you put watery clay into the vacuum of an electron microscope, you drive out the water. This not only kills your microscope (followed by you getting "killed" by your boss, e.g. me), worse, it changes the consistency of your clay! Common red brick clay or shale clay, containing organic and iron oxide impurities. Useful for bricks but not so great for pottery. Ball clay, an extremely plastic, fine grained sedimentary clay, which may contain some organic matter. Fire clay; a clay having a slightly lower percentage of fluxes than kaolin, but usually quite plastic and highly heat resistant. Bentonite An extremely plastic clay which can be added in small quantities to your regular clay to increase its plasticity. Now clean your clay, add this and that. For example fillers and fluxes that help shape retention or control the fusion or hardening point during firing, and increase the strength of the fired product. Then beat it and homogenize it - and you are ready to make some pottery or ceramics. Now you must produce the shape you want. Coil up "snakes" of clay, use a potters wheel (invented in Mesopotamia sometime between 6.000 BC and 4.000 BC), press clay sheets into a mould - I don't care. All these methods are very exciting for Artists but not for Materials Scientists. Now I care. Interesting things start to happen as soon as you heat up your "greenware". First you drive out "free water". Not surprisingly, this happens around 90 ºC to 150 ºC (190 ºF - 420 ºF) or just in the sun if you allow longer times. Your greenware now turns from "leather-hard" to "bone-dry". Your pot or ceramic piece becomes firm, and this is the state best used for trimming or attaching ornaments or just handles. Second you fire what is now called a "biscuit" in your kiln. Of course you can omit step one and put your greenware right away into a hot fire or a kiln. What will happen around 500 ºC (930 ºF) is "dehydroxylation", driving out the "dirty water" layer in the picture above. This leaves you with precursors of alumina (aluminum oxide; Al2O3) and silica (silicon dioxide; SiO2) particles plus other stuff. At 900 ºC (1 650 ºF) you get nice crystal of alumina, silica, plus whatever and plenty of pores, left back from all the stuff driven out. If you now go for considerably higher temperatures, you start to sinter the crystallites together, reducing the pore volume. No more needs to be said because I have covered all that before - in the "powder metallurgy" module. The trick, of course, is to operate a good kiln at high temperatures with a minimum amount of fuel. In the old times, your fuel was wood - either just dried or in the form of charcoal, and this was a problem. A good clay pit would give you plenty of stuff for many pots - but you only can cut down the trees around you once in a life time. Transporting wood (or anything else with either large volumes or large weight) over large distances just isn't easy and thus expensive if you only have oxen drawn carts at your disposal. Pottery at this point ceases to be just a problem of materials and pyrotechnology but becomes an economical enterprise. What you typically get a this point is "earthenware", a generic term referring to porous stuff that was fired around - roughly - 1 000 ºC (1 830 ºF). Earthenware includes familiar stuff like Terra-cotta, Delftware, Faience, Majolica and so on. Earthenware is great for all kinds of things, from lowly food containers to high art. If you want non-porous pots or ceramics, however, you need to either remove pores by sintering (needing very high temperatures and suitable clay) or you must glaze the outside (or inside or both) with something like a glass. You may us this process also for decorating. Sintering is a gradual process. Pores disappear as a function of time and in particular temperatures (the key word "diffusion" appears now, of course). Earthenware, normally fired at temperatures in the range of about 1 000°C (1 830 °F) to 1 200 °C (2 190 °F) is still rather porous. Stoneware, fired around 1 100 °C - 1 300 °C (2 010 °F - 2 370 °F) is already dense and harder than steel but opaque, and normally only partially vitrified or "glassy". Porcelains are fired around 1 200 °C - 1 400 °C (2 190 °F - 2 550 °F); they are dense, fully vitrified and translucent. Of course, firing alone will not do the trick, you also must pay attention to find the optimal clay for your undertaking. Coat the desired surface by something that will turn into a glass (see below) at the temperatures you employ, and your porous ceramic piece will be coated by an impenetrable layer of, well, a glass. The glaze can have all kinds of colors and thus provides for decoration in one fell swoop. Your glaze typically is a powder or some kind of slurry, and you dust it on, or spray, paint, dip or whatever you can come up with. The glaze, once it "vitrifies", i.e. becomes glassy or semiliquid, would tend to glue your piece to the kiln, so you typically do no coat the points of contact. Interestingly enough, common salt (sodium chloride; NaCl) is a good glaze. At sufficiently high temperatures it reacts with the clay to sodium aluminosilicate, a regular kind of glass. The picture illustrates a simple truth: a lot of pottery efforts went into producing something that looked like proper porcelain but was easier and cheaper to make. On the other hand, bone china might be seen as an improvement of the chinese "China"; it contains bone ash, supplying phosphates. It was developed by the English potter Josiah Spode, and is famous for its whiteness and translucency plus the very high mechanical strength and chip resistance. This kind of Greek pottery / vases appeared around 500 BC and is a science in itself. I only want to point out that a rather distinctive feature comes from the juxtaposition of black and red(dish). How are those colors achieved? As mentioned briefly elsewhere, the trick is to use clay that contains iron oxides, i.e. reddish stuff. That is easy. Firing this kind of clay in an oxidizing atmosphere - the normal atmosphere in a wood-fueled kiln - will turn your pots reddish because any iron contained in the clay oxidizes to bright red/orange hematite (Fe2O3). In contrast, if you can manage to produce a reducing atmosphere, your iron cannot fully oxidize and turns into black wüstite (FeO) or magnetite (Fe3O4) instead of red hematite. First step: firing and oxidation, at temperatures around 850 ºC - 975 ºC (1 560 ºF - 1 790 ºF) for about 9 hrs. You go through all the process of driving the water out etc., and the iron in both clays - the base clay and the stuff in the slip - fully oxidize to hematite and everything will be bright red. Second step: Add plenty of fuel including possibly "green" wood and partially close the air supply vents. In other words: produce a reducing atmosphere. Raise the temperature a bit (difficult under those conditions) to make sure that your clay in the slip sinters ("vitrifies") completely. The red hematite in both clays gets reduced to magnetite or wüstite and everything is now black. The "slip" clay has now a glassy surface without pores, the base clay is still porous to some extent. Third step: Switch to on oxidizing atmosphere once more. Just admit lots of air and add some dry wood. The iron in the base clay oxidizes to hematite once more, turning things red. The iron in the slip clay, however, stays black because it has now a sealed surface, impenetrable to oxygen. Cool down and you are done. It doesn't just sound a bit tricky, it actually is tricky, very much so. 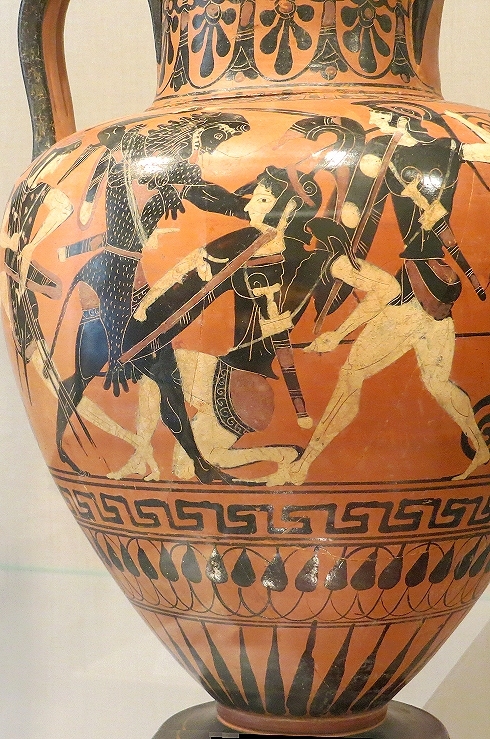 Lots of things can go wrong and there are many examples of Greek vases where things did go wrong. There are far more examples, however, of masterpieces that even a modern potter with all the blessings of science and technology would be hard pressed to duplicate. Glass is essentially a (dirty) silicate; not too different in its basic composition from a ceramic material. The word goes back to the Germanic "glasa", latinized "glesum", denoting something shiny, shimmering, with a luster. Obsidian, for example, exhibits these properties and is indeed a (natural) glass. Schematic drawing of a crystalline and amorphous silica. On the left we have crystalline quartz (SiO2), known as rock crystal, with an orderly and repetitive arrangement of the silicon (Si) and oxygen (O) atoms (in tetrahedras; outlined on the lower left). On the right is amorphous glass with no apparent order, consisting once more essentially of SiO2 plus some incorporated "dirt" like sodium (Na). Pretty much all materials can be made amorphous if you cool real fast from the liquid state. For most materials, including all common metals, "real fast" is too fast for all but very thin films. For molten silica it is not too difficult to keep it amorphous, essentially "freezing-in" the structure of the liquid. That makes for "quartz glass", ultra-resistent to about everything and therefore used a lot in in chemistry and technology, but requiring very high temperatures for shaping it. Making and processing glass gets much easier if you add "glass formers" like lime (CaO) sodium oxide (Na2O) or other oxides (stuff you find in ash). Not too difficult to do in principle but far more sophisticated than run-of-the-mill pottery. Not only is it very easy now to keep the stuff amorphous even at leisurely cooling rates, the "melting point" also comes down quite a bit. In fact, there is no proper melting point anymore. If you heat a glass, it will start to get viscous above a certain "glass transition temperature". If you keep increasing the temperature, the viscosity goes down steadily and at some point you call it liquid. You know how that works. Take some honey, put it in the freezer, and after it is frozen solid, start to heat it up. It won't melt, it just gets increasingly "softer" or viscous. Scoop out a spoonful at summer temperature and the impression of the spoon will disappear within a few hours because the stuff can flow, if ever so slowly. Heat up a bit more and you call it liquid. There is no definite phase change solid - liquid, however. It is a gradual process. Same thing with glass, just the temperatures need to be higher. Why is glass transparent to light while silica or alumina ceramics are not? Actually silica or alumina single crystals - rock crystals or colorless sapphire - are perfectly transparent to light, too. But ceramics are by definition poly-crystals full of defects, and those defects scatter light in all directions. The (clean) material then appears to be white and a bit translucent; just like milk glass, where light-scattering particles were added to the otherwise transparent regular glass. Transparency, the main property of glass, thus is a direct consequence of it being amorphous and thus without large non-uniformities on a sub-µm scale. That implies that early glass was not all that transparent because you have to keep out the "coarser" dirt that otherwise interferes with light transmission. Early humankind knew and adored natural glass like obsidian or amber (technically a glass, just not silica based). Any kind of smelting that produced slag automatically produced glass, since amorphous "vitrified" stuff, vulgo glass, is pretty much always a component of slag. Intentional glass making, however, began much later than smelting or pottery. Glass making, according to present insights, started around the Mediterranean around, roughly, 3000 BC - 2000 BC. The dating problem is that only a few small artifacts were found before about 1500 BC - and these could haven been produced accidentally as by-products of smelting. As with metal smelting, the Chinese came in considerably later. 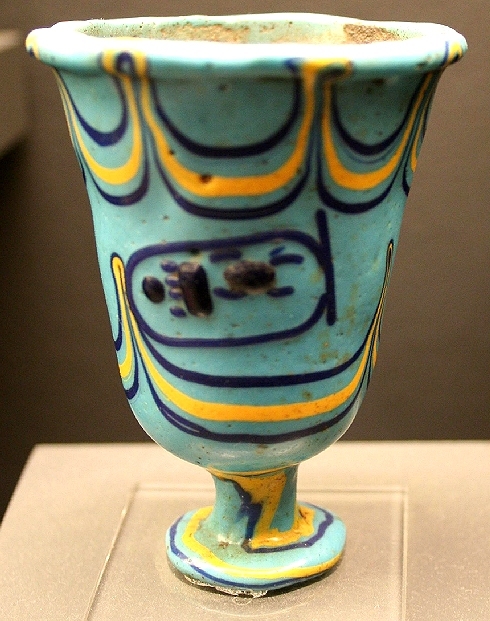 The early Egyptians, it seems, went first into glass making (and fayence, see below) in large style, and the oldest known "real" glass object (as opposed to small shards and beads) is the goblet of Thutmoses III shown below . The Egyptians, however, did not invent the making of glass but just perfected it and used it extensively. The Romans (and everybody else with some kind of civilization) went into glass making ever since, producing amazing objects on occasion. In archaeology, however, glass artifacts seem to be far rarer than ceramic stuff. This is easy to understand. Simple earthenware ceramics, made from whatever halfway suitable clay one could dig up locally, was good enough for most purposes. So why use glass, where you had to import quartz sand and do a lot of other things just right? In antiquity, glass was for artistic things and for the wealthy. Glass, of course, is first and foremost needed for windows and was indeed used for this purpose early on by the Romans. But only rarely, in small sizes and questionable quality with regard to seeing the outside world undistorted. Major use for windows did not come into being before 1200 AD, witness Gothic cathedrals. Shaping your object when working with (hot) glass is one of the big problems. Of course, since it is more or less liquid, you can use some kind of casting technique but that is not easy. Glass blowing isn't easy either so one way of doing it (like the cup above) is to make coils of the stuff which you wind and ease into the desired shape as longs as they are still deformable. Glass cutting isn't easy either but was done for finishing products. Egyptian Fayence needs to be distinguished from common fayence or faience, the fine "tin-glazed" (whatever that means) earthenware pottery associated with the Italian town Faenza. I put Egyptian Fayence at the end of this module because here it is easy to define: Egyptian Fayence is halfway between ceramics and glass and easier to make than true glass. It is therefore also older then true Egyptian glass, dating back to the 4th millennium BC. In contrast to pottery, fayence is not made from clay but from quartz sand, plentiful in Egypt but not necessarily in other places. Add some lime, metal oxides (ash in other words), clayish stuff, and so on, and you have almost the ingredients for making glass. However, if you don't "vitrify" or melt the stuff into a viscous liquid because your pyrotechnology was not quite up to that, you just sinter the quartz particles together or perhaps glue them together with some liquefied in-between. Fayence, like pottery, has the advantage that you can shape your object before firing. Glaze it with some vividly colored (mostly blue) real glass, and the finished object looks glass-like (shimmering, luster, and so on) but are not transparent. 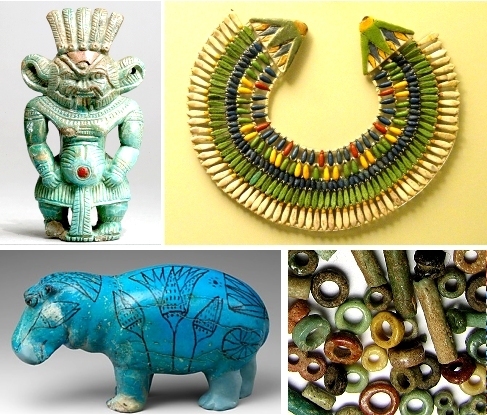 Fayence was extremely common in ancient Egypt, and objects span the full range from simple "glass" pearls to complex sculptures.